The action portion of the site is for anyone interested in them, or who may even be considering doing it on their own. I am under way with it and hope, through my own efforts and the help of others, to bring an excelent result within grasp. After all, the plan doesnt yet include doing anything radical. Only applying the common principals for which David Stanwood provided a more standardized terminology. Piano actions are a marval for anyone who appreciates Isaac Newton's view of the world. Some of what is left to be addressed includes a key dip of slightly greater than 11mm, a travel of over 50mm, and an action ratio of about 6.2. In short, Ill be raising the hammer line and grappling with the idea of replacing shanks/flanges, or possibly doing something with the capstans, which dont mate all that well to the assist spring whippen heals, anyway. The downweight is sprung down to around 55 grams in the bass and will go further before weights are taken out, or other parts are changed. I know its brave to dive into this stuff, but with a better understanding and ability to articulate what the preferences may be, I am convinced the action will, one day, be closer to what we ultimately want. Three pictures below show two graphs and an image of what weights look like when impregnated in a hammer core. 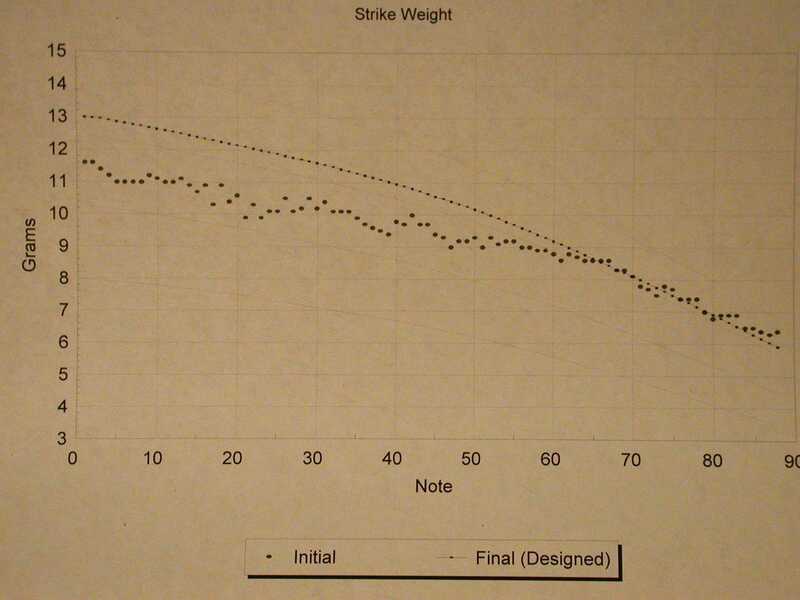 The first graph effectively measures these new hammer weights, while the other shows the weight found when measuring the fingered end of one of the piano keys on a scale, with nothing on its opposite end. My efforts are being aborted, in part because I've discovered at several turns how difficult executing a good action can be, in part because as a non-professional I can not "sub" out any portion of the work and lastly, in part because the time afforded by having no children will be no longer once our twins arrive early this Fall. OK, so its mostly the last one. The Renner/Steinway parts are boxed and ready for assembly in what will be a full Stanwood installation. It is currently set to take place over the next 6 weeks. The goals include adding weight to the hammers at the treble break for a more "bassy" second and third octave, raising the downweight in the treble and generally smoothing things out to a fairly normal feeling that isn't seperated by more than 4 grams, or so, from bass to treble. One of the favored approaches will actually be to add weight to the keys as opposed to increasing the amount of work the springs do. The springs may ultimately do little more than make up for the small variations in downweight from key to key. This is just a preference that in this case was formed from playing actions, including Stanwood, that seemed to have too much weight taken from them. The time spent handling parts and learning action dynamics has not been wasted if, as originally stated, the ability to better articulate preferences leads to getting what is desired. That, I think, is secure. Wish me luck with the new family! 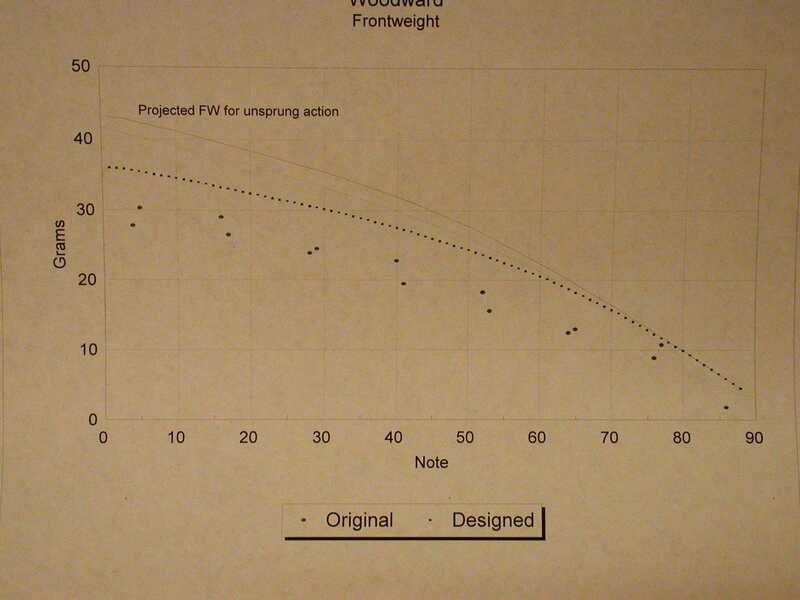 5/4/03 - I need to, and will, keep trying to post .pdf spreadsheets showing what I am going through in evaluating parts selection based upon measurements of weight and distance. Choosing parts that change dimensions within an action can become a Pandora's box, unless you can draw upon collective experience and accurately assess where things are in your own situation. As recent as the fall of 2002, more technicians at ptg.org seem to be sharing favored leverage ratios and strike weights. Frequently, these discussions take place in relation to Steinway rebuilding and can either be directly applied, or serve as a range, to examples of this vintage. At least, that's my hope. The case with S&S 114869 is one of having a leverage ratio of 5.74 (as averaged over 25 keys), Strike weights that go from the upper medium zone (Stanwood's empirical reference material) to the lower medium zone, a key ratio of .545 and the commonly used 16mm knuckle. I've left other things out, but these numbers drive a scenario in where it is suggested a 17mm knuckle should work. Leverage of 5.74 is in the normal range, but my own, and others, oberservations have lead to a desire to lighten things up. In addition, the approx. 1.4 gram binder clips used to simulate heavier hammers were found to improve tone and that itself will require weight, leverage and/or spring, adjustments. On a side note, this discovery meant a lot. 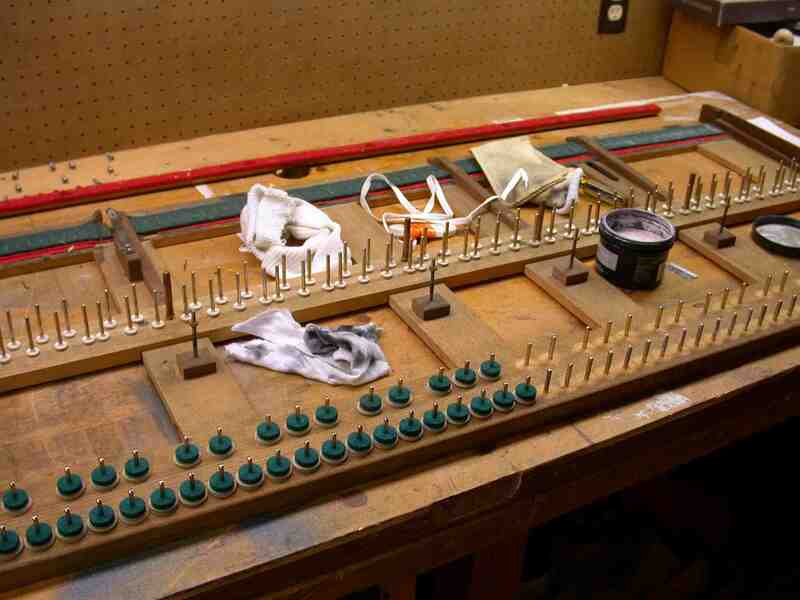 Where many pianos have their hammers lightened to achieve a better feeling action, I imagine it isn't very many technicians who experiment with first adding weight to be sure they aren't going further away from optimal tone. I am starting to conclude, from reading more strike weight data accross brands, that many pianos that sound big for their size do so, in part, by using relatively massive hammers. Voicing can only do so much in making up for this lost mass. Another anecdotal discovery revealed that in an unscientific study a piano that had higher weight hammers installed received praise for feeling lighter. It makes possible the idea that the added mass made enough of a tonal improvement that the piansts felt they had to provide less input. 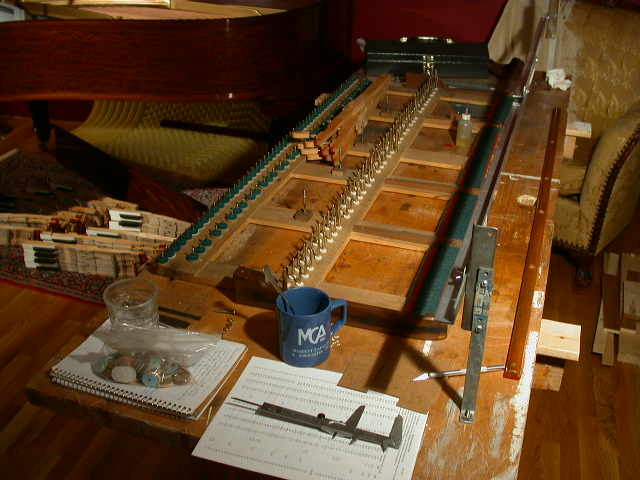 A set of Steinway hammers and Renner shanks with 17mm knuckles are being ordered at this writing. End 5/6/03 update. Two 4/12/03 pics showing the action now near the piano. The let-off rack breaks at the bass break and adjusts for the changing string heights. It has also been set to minutely slope from end to end. 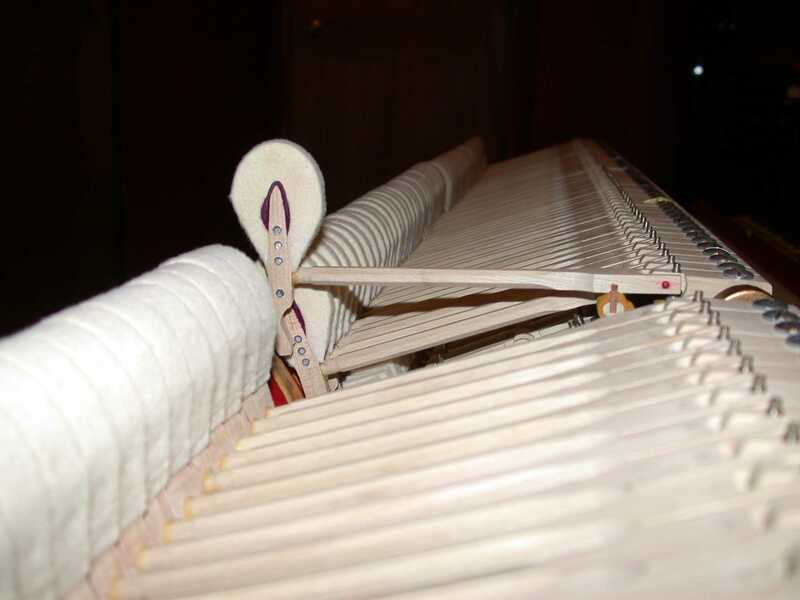 It will probably save 3-5 dozen trips in and out of the piano for the number of times adjustments will be made to get things right. Final adjustments are for the last trips in and out. As of this writing the travel is 1 13/16" with a 10mm dip. After reading Randy Potter's Action Handbook for some data for someone else I noticed his specs for the Steinway B were a range of 9.9 - 10.6mm dip, with the common hammer travel of 1 3/4". Taking that as gospel, it suggests I should be at the upper limits of what enables the keyboard to regulate. The less the key travels and the more you want the hammer to move is a game of regulation that, in my case, was aimed at reducing the distance between let-off and the bottoming of the key. Dip had to be reduced from its former >11mm, but the "feel" of the action is now more resistent at the last portion of the travel. So, its back to 1 3/4" travel today, with a marginally sooner escapement and what I expect will be more consistent feeling behavior from the regulation. The knuckles are still suspect for being too flat and worn. The technician coming 4/23, and I, will evaluate their replacement, the 17mm idea and a number of other things, including the hammers. 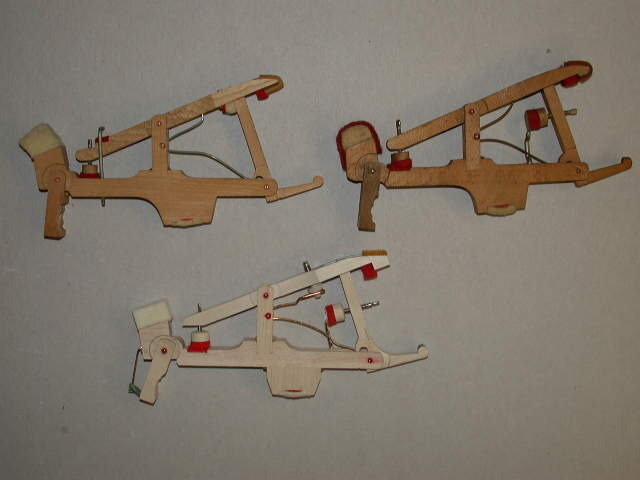 The whippen picture shows the progression of what has been in Steinways since the turn of the century. The Renner Assist Spring whippen is beneath the original, non jack-adjustable, whippen on the left and the more modern one on the right. On it you can see the assist spring to the left and another unique adjuster for repitition spring tension on top. Much easier to picture, than describe these differences. Just some of the tools. The tools are mostly new and not terribly hard to get. Digital gram scales are available for <$100 if you search the net. 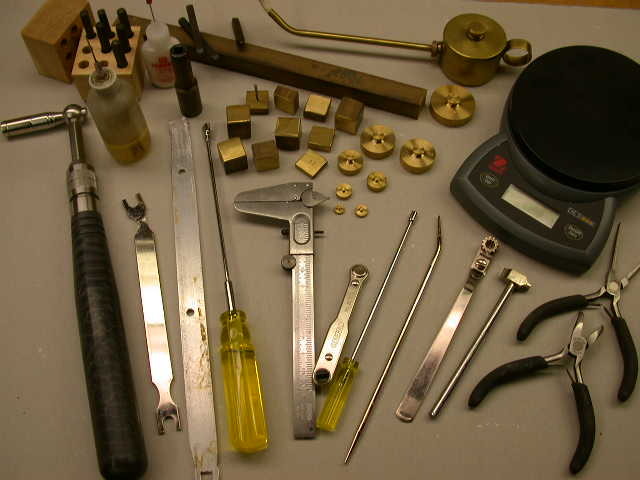 Once calibrated, gram weights to the 1/10th can easily be prepared on a grinder. You can see the box brass stock I chose below. 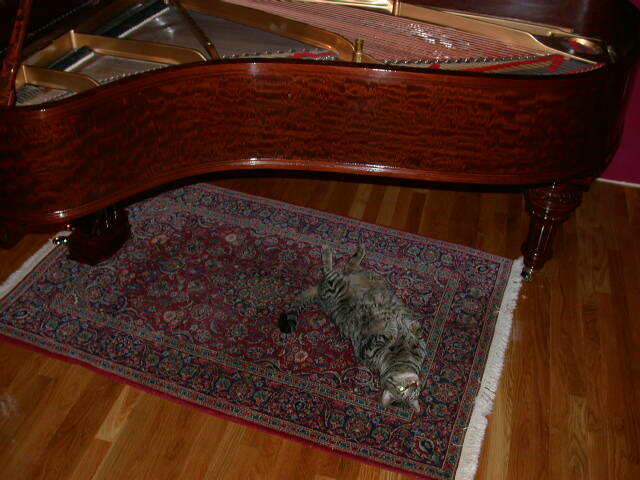 Having the action for 6 months while the refinishers worked gave me time to do quite a few things without the piano. ....He's checking out the crown and the 3 new beautiful scratch posts.